You're browsing: Home / Meri awaaz suno / Rafi Nite "Yaad na Jaaye"
Friends, Radio Manpasand, want to say a very heartfelt Thank You for joining us last Sunday, 12th June at Cook Neighbourhood Hall for “Yaad Na Jaaye”. You came and just as we had predicted, we all took a trip together Down Memory Lane. And what a nostalgic, beautiful trip it was! One we could take again and again and never be bored. That is the magic of Rafi Sahab. We are very grateful to all our supremely talented dancers and singers who performed on the stage for us that night. Performances make or break a show and you have to agree that every one of the performers that night did such a great job of bringing out the ‘Rafi flavour’ through their sad and happy, fast and chatpata, romantic songs – and of course the awesome classical dances. We can only say to our performers that we are honoured that you participated: Thank You Very Much. And they were: Pankaj Das, Tarun Agasti, Abhijit Deonath, Ira Patkar, Raj Subrail, Jagdish Wable, Manoj Jaychandran, Ravi Vaikyl, Vanaja Dasika, Dayeeta Sengupta, Arun Basu, Moneesha Choudhury, Dr, Rahul Samanta, Arun Basu and Vikas Randev. Our very grateful thanks also go to our supporters for providing us their valuable support and giving away quiz and door prizes, and they are: Bharat International Belconnen; Apna Indian Bazaar, Belconnen; King of Curries, Belconnen; Chillis supermarket, Gungahlin; Monga Indian Groceries, Gungahlin; Kitchen King in Phillip; Spice World Phillip; Jabal Halal Meat & Grocery Store, Kippax; Patels Asian Grocery Store, Queanbeyan; Eros International, Sydney and Mind Blowing Films, Melbourne. 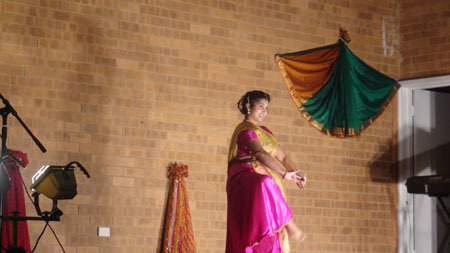 Besides them, we would also like to thank the Bengali Cultural Association; Hindu Temple & Culture Centre (HTCC), Florey; Vishnu Shiva Mandir, Mawson; ACT Office of Multicultural Affairs (DHCS); India Australia Association of Canberra (IAAC); www.Mohdrafi.com for all their generous support and Neeta’s Indian Cuisine, Gungahlin for providing a fabulous dinner and snacks, increasing everyone’s enjoyment of the show. Nothing is more gratifying than knowing that the Community appreciated and enjoyed “Yaad Na Jaaye”. We have received encouraging feedback and we are delighted to say all of it has been positive and below are a few of them. However, if you were at the show and would like to make any suggestions, please do write and let us know. We will certainly take it on board, as our main aim is to do bring enjoyment to the local community and to do it right. Without you there would be no show. Bahut Bahut Dhanyawaad for all your love, support and encouragement !! Aap log lage rahiye… aur hum milte hain aapse ek chhote se break ke baad !! IT was a great and grand function with the variety in singing, background on Mohammad Rafi Sahab and the lovely songs sung by all the artists. Great memorable time. I have to add that I was a 20 year old when Mohammad Rafi Sahab died and the whole state Govt of Maharashtra declared a holiday on the day. From college about 50 students went to see his Janaaza and I still remember not telling my parents that I was going there and coming late. By the time I returned it was past midnight and remember my parents being upset with me. But I had the fortune of seeing him at a live performance at Bombay Open Air theatre and at the funeral. HI all, I think you all deserve a “big congratulation”. You all have scored more than 7 out 10. 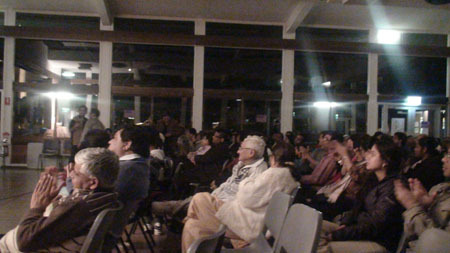 We had 200+ audience, and I think all had a good time. Hard work was well worth it. It was a fine performance and I am sorry I was unable to stay for the second half. There were two qualities that stood out – beautiful and blue. These qualities symbolised the enduring quality of the music and lyrics, the memories, some sad and still strong, and the enthusiasm of the performers. More than this they also represent the hard work in the lead up and on the night. Well done and thanks for the invitation. Salaams and Greetings from your city of Joy. Congrats for bringing off Yaad Na Jaaye, so brilliantly. I was miles and miles away but the essence of the program and the flavour of success imbibed on the evening of the 12 June was wonderful. Look forward to some a/v clippings and other related news. Indeed this was a grand success. Congratulations to all. Hats off to you Nasreen. I agree, it was a fantastic program!! I had phone calls from Pratibha, Lakshmi etc to give feedback about he program. Everyone gave a very positive feedback. Nasreen you have done a fantabulous, superb, excellent job, so much hard work and running around all paid off on the night. It was amazing to see so much crowd Canberra. Good thing, many people stayed back till the end, so it was good sign. I must say Ira Pathak, Vanaja and Duitha’s (not sure if spelled it right?) 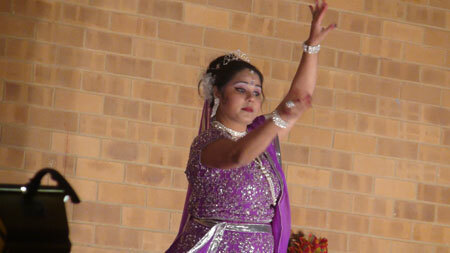 dance performances were excellent. Loved each and every song sung by our talented bunch. Mani Bhai aap ne to kamal he kar diya and Manish you did a wonderful job on the control, slides etc. Ajit da and Abhijeet we need to come together to do more successful programs like this in the future. An excellent and unique show put together by you all. Great effort! Hi Nasreen, Indeed it was a great program!! than I guess expected since we had to open up the partition to put more chairs. I would say a job well done and congratulations to everybody involved with this event. Thanks for your nice comments and for organising such a wonderful programme. I don’t know, how much time you guys have spent in organising this function. Hats off to you guys!! Mani and your MC was good too. You guys have really done a great job. I hope, you will organise such a wonderful events in future as well. Did you sleep well on that night? See you soon. Manish is also planning to organise a get – together soon. I really enjoyed performing and I felt it a great honor performing for a song sung by such a great singer,and I dont think that you have to thank a person(me) who has been a part of the team.Please keep in touch. Thanks Nasreen you don’t have to apologise as you guys had put a lot of effort organising a fantabulous show that Canberrans will remember for years to come. I had seen Md Rafi at the Wills sponsored Filimstan night in Sept of 1979 at Cooperage Colaba. It was a great performance and a memorable one. Those days we did not have cameras, otherwise would have carried the memories on Black and White canvas. Hi Manish, Rafi night, kya baat hai, mazza aagya (woh bhi free main). 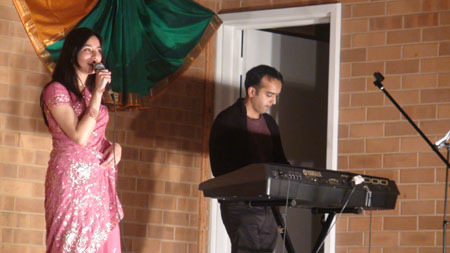 It was beyond my expectation as I headed few time karaoke songs programs before in Canberra but this time it was very interesting and entertaining. The presentation was excellent with added visuals and commentary by Mani and Nasreen. It reminded my teen and youth time in India, I have grown up listening Rafi songs. The selection of songs by singers was also admirable it kept the mood all evening. Dance sequences’ on Rafi songs was added another colour to the program..Really beautiful dances. 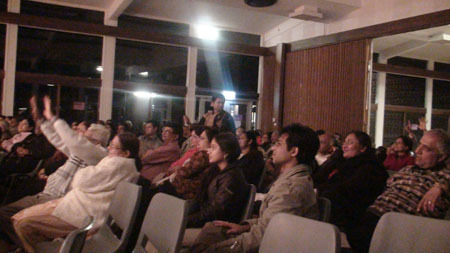 Kalpana’s quiz kept audience engaged. Manish your effort on controls was the back bone of the programs though we haven’t heard your voice as RJ in the hall. Hope to see more programs like this one in the future from Radio – Tarhka maar ke!. Neeta’s food was good too. Bravo to you all organisers and thanks for making an enjoyable night. Purane gaano main dam hai, old is gold, long live Rafi’s voice. Hi Manish, Can you please convey our thanks to all the organisers and congratulate them on a very well conducted program. We know how much effort it takes to produce the smooth final result as the one on Sunday. You do not have to hope that we enjoyed the program – we most certainly did. The format – of interspersing live performances with memories down the lane – was lovely, and provided the right mix of entertainment. Rafi has always inspired me throughout my life. I really cried when I heard his songs and saw his life-history on the slideshow. It brought back lots of my memories! Dear Manishji, Yaad na jaaye program was a memorable program indeed. Most of the associations in Canberra have been avoiding long weekends for big events fearing thin attendance. But Yaad Na Jayee program proved to be a myth-buster and witnessed unprecedented and probably unexpected attendance. It was evident from the realignments in seating arrangements. More chairs were added to accommodate the audience. From every measure, I think and many will agree that this event was a grand success, wonderful commentary and show of local talents. Please keep it up. I am waiting for your next program. Namaste! “Zindagi bhar nahi bhoolegi woh Rafi kii Nite.. Radio Manpasand kii haseenayon se mulaqat kii raat” !!.. I haven’t seen in Canberra any musical nights for years. You all should bring such musical nights more often. Dear Manish ji, Please accept our congratulations for wonderful performance of full team of Manpasand on THE NIGHT. Sequence of programme and journey with Rafi Saheb’s life was just amazing and we as audience could feel the hard work put in by your team to bring that on stage. Choice of songs was wonderful and were sung well by performers. We are eagerly waiting for your next show of Kishore Night. This entry was posted on Saturday, October 1st, 2011 at 6:57 pm	and is filed under Events, Meri Awaaz Suno. You can follow any responses to this entry through the RSS 2.0 feed. You can leave a response, or trackback from your own site. so called fazal ahmad has 10 names and he has gone mental … maaf kardo yeh paaagal ko doston. he comes in many names herein and throws dirt. its possible only in a public forum……. Mohammadji- Yes, there are some. But, the biggest name is Sonu Nigam, who has sung almost all the hindi songs by Mohammad Rafi. You will be surprised, but he has even sung his hardest songs like “O duniya Ke rakhwale”, “Dono Ne kiya tha pyaar” etc. Most important thing is that Sonu Nigam has done considerable justice. Google any of Sonu`s rendition of Rafi`s songs. And you will get to see a unbelievable attempt! Hey,tell me honestly is there even one singer who can sing just like the Late Lagend? from bajaj familty even built a restaurent on rafi saab with his songs. even constructed a concrete bus shelter in the name of rafi saab. which means “rafi in the hearts” for one year on every sundays. any singer or any artist is being treated anywhere in the world. 31st july – it shows “death anniversary Muhammed Rafi”. can any artist – lataji – ashaji anybody can even dream like this? Thanks for the prompt comments and subsquent phone call today morning.What u r saying is absolutely correct.We should ignore such stray animals .the more we react the more they get active.After all this what exactly they want.So I appeal to all my brothers and sisters of Rafi saab community to stop reacting to such disillusional persons like fasal and concentrate more on rafi saab. 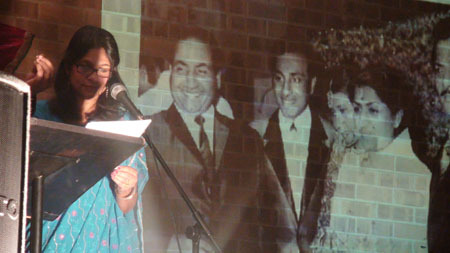 Rafi saab. You are missed each day of my life. thanks a lot for your phone conversation and your apprisal of the ” ghamaasaan yudh ” with regard to a vagabond who has strayed into the neighbouring field and trying to run amock. it happens. what happens in such cases ? either the other flock chase it off with relentless pecking or the animal gets isolated and vanishes. this beautiful dedicated website of the avataar ( mohd rafi sahab ) is very often infiltrated by renegades, owls, rhinos, hippos and the ilk which are by nature thick skinned and mean no harm but their ugly presence. learn to ignore them and they will graze around a bit and vanish. agar aap chaaraa daalogey toh woh aur thodi der rehkar aapko tangg karengey. hence, dont provide unwarranted fodder. way back self and binuji had discussed on this subject and we had decided not to fall into such silly traps, but, yet i find it is unfortunately repeated. pradeepji, is doing yeomans service, just about keeping the goings on vibrant and alive. hence it is asking for too much, expecting him to delete abuse. anything not concerning ” rafi sahab ” is plain ” abuse ” and should be treated so by all. binuji, bhagchandji, santoshji – may please note and not react to stupid remarks made by straying cattle. these are some of the reasons why you do not find people like naraynji, self nrpbhai, murtygaru and many other veteran rafi fans abstaining from commenting on this beautiful rafi sahab website. what i have said is purely my opinion and are not meant to hurt anyone’s personal feelings. this is just to put records straight and clarifying a stand point with regard to basic eticates in a dedicated website. jai ho jai ho jai ho rafi sahab – tussi wakai great ho !!!!!!!!!!!!!!!!!!!!!!!!!!!!! Sorry I missed an important point in my earlier comment posted just a while ago (that post is under moderation). Fazal saab, your bringing in the religious factor (…….. and coincidently, all these are hindus and we both are muslims….) while responding to Ahamed Kutty ji is atrocious, uncalled for, in a bad taste and shows you in further poor light. Please stop this non-sense. Selecting a screen name (unknown, Rafian or anything) and maintaining the same for all your blogs, comments etc. is one thing and changing the name for a same post and posting it at different web sites (as you have done) are altogether different conducts. Hope you understand the difference. Not only that, you have submitted that post (no. 8 here) at a number of threads on this web site (refer to my post no. 14 where I have pointed it out). If all this is not an indicator of your dubious intentions of creating unnecessary dispute, instigating Rafi fans, then what exactly is this? And when you are caught, you are just trying to shield yourself through some stupid arguments. As far as you observation regarding “..depreciating you for the sake of it…” is concerned, I don’t need to do it, nor I intend to do it. You yourself have done it through your conduct. I merely pointed it out. Your statement that you did not say a word that would belittle Rafi saab is factually wrong. I had specifically pointed out the stanzas of your post that I found belittling to Rafi saab. Please go through my earlier post again. Whether Kishore had the aptitude for classical training or not is not the point, the fact is that ‘he was not trained’, and if he had the inclination who stopped him from going through that grind? With his illustrious elder brother firmly established in film industry and availability of resources or a trainer not an issue, then what stopped him from undergoing the classical training? Does it not indicate his ‘lack of interest’ in that? Anyway, as I said in earlier posts also, I am fully aware of Kishore’s strengths also. I have decent collection of his songs which I listen often and thoroughly enjoy. The problem is that based on those few strengths, you elevate him to a position that belongs only to Rafi saab. Do you mean to say that Kishore’s talents were so hidden (behind what?) that so many music maestros (Naushad, Roshan, Madan Mohan, O.P. Nayyar, Shankar Jaikishan etc…. to name a few) could not spot it? Even S.D. Burman (who you argue spotted that talent) used him much less than Rafi till 1970. There is no issue as far as your preference for Kishore’s voice is concerned. In a democratic country every one is entitled to his choice. The issue has been your (mis)conduct and intentions and the falsehood you are spreading. Your repeated mention of Anurodh song really raises doubts about your knowledge even about Kishore’s songs. This song, though ‘not bad’ is something that even Kishore himself would not have considered among his favourites. I was bit pained to read that great Rafian like Mr. Narayanan does not write comments because of quarrels on trivial issues. Through this post I would like to appeal to Mr. Narayanan to continue posting his valuable comments regardless of these quarrels. He may not participate in these quarrels. It is like a family/ home, where apart from the valuable advices, love, affection, devotion etc. that Rafi fans show, the house (site) also needs to be defended from trouble makers/ intruders. Why dont u stop posting comments of this Fasal liar on this holy site.I spoke to Mr.Narayanan of Banglore Baar Baar Rafi foundation .I asked him why he is not commenting nowadays.He told me the reason was the uneccessary quarrels on trivial matters .He along with many of his friends have stopped visiting this site.So I request u to throw people like fasal out of this site. Kishore’s first song was in Ziddi (1948). I guess he was 19 then…not 29. No need to repeat the fakir story…everyone knows about this. I don’t need to be his son or father to figure this out. His lack of classical skills is acnowledged by one and many….including Salil Choudhary who was never a Rafi fan. How many music directors considered him for classical songs?? ?…if you browse through the Golden Collection CD of Classical songs in movies, there isn’t a single Kishore song. So what does it mean? Even when he was very popular, he was never a choice for these songs. You need to grow up here and stop being disillusional. You are already a laughing stock here so my advise to you is not to expose your ignorance any further. I don’t think you understand what throw really means. As mannadey said in one of his interviews, he learnt to throw his voice after listening to rafi saheb. I guess you probably learnt that from Kishore…no worries…he wasn’t that bad himself. You show your class by hailing the Anurodh song which is pretty average song even by Kishore standards. You are confusing timbre with depth. I am not surprised though, as you seem to confusing stupidity with guts as well. Just saw your post. All I can say is whats the obsession with my name? “Its a serious matter that you have different names, Please make some honest investigations into your real name”….Whats that supposed to mean now? I mean, are you commenting just for the sake of deprecating me, sir? On this same site, I have seen people with names as ambiguous as “unknown” or “kumar”. Now, how fair is that? Anyways, lets not get into all these useless matters. I keenly went through your comment. All I saw was a lack of acknowlegment of my arguments and I get a sense that you are premeditated to say an outright “NO!”. And all you can say is “I can demolish your point by point comments, but it will be wastage of time”….I mean, you cant get anymore unconsiderate, can you? Then, you are saying that Im belittling Rafisaab. I didnot mention a single word that means to call Rafi anything less than a legend. Just read your comment. I would definitely like to correct your misconceptions. First of all, who told you that KK did’nt have an aptitude for classical songs?? Who said Kishoresaab didnt have interest for classical singing?? And on what basis are you making a conclusion that he wouldnt have been able to learn classical?? Are you his son? His brother? His wife? Or are you his close friend or a collegue? Whats the proof? PLS for god’s sake, do not make baseless comments just with a motive to belittle Kishore and aggrandize Rafi. Moreover, you really need to learn about your fav singer. Rafi`s father was a barber. Rafi started singing by imitating chants of a fakir in his village. It was his brother though, who spotted that Rafi could sing. He took Rafi to Bombay and made him learn classical music from huge names like “Ustad Bade Ghulam Ali Khan” n Ustad Abdul Wahid khan. After that he got a break in the industry and his career shot up. While Kishoreda was first dragged into acting by his famous actor-brother Ashok Kumar. But, Kishoreda turned out to be a star. He was admired for his acting talent. But it was after years that S.D Burman spotted Kishoreda`s talent. Kishoreda first sang when he was 28. It was a little late to learn classical, wasnt it? Kishoreda, solely on the basis of his innate resonant voice, went on to fascinate the world. His awaaz naturally was so “kheeli huyi” and yet, “bhaari”. And there is barely anyone who can dislike his voice. I mean, who will dislike such a beautiful voice? His songs bring a smile on your face. It can only be rafians who force themselves to dislike kishoreda. But for most music lovers, he is irresistible! And oh please, dont even talk about “throw”, no one can sing Kishoreda`s songs with his heavy throw. Rafi was also good but throw is Kishoreda`s speciality. There would be no one who can sing his songs I mentioned in my earliers posts. And “Aapke anurodh” is beyond your calibre to understand music, sir. If you were a singer, then you would get a taste of it. As far as Rafi is concerned, “Dard-e-dil” is a good one for deep-throated singing. But, it cannot match Kishoreda`s “Meri bheegi si” and “Koi Hota Jisko Apna”. They are perfect examples of the heavy base this guy had. Unbelievable!!! which rafi saab possess.” After this comment, I have got a very good idea of your music sense and mentalilty. “any singer male or female” n “can even dream about”- I can just imagine how you were able to use those words. I wonder that if you are aware of “Lata Mangeshkar”-who has way more fans than Rafi and who is the only singer to receive Bharat Ratna ever. Asha Bhosle, another globally recognized singer and truly the godess of pop singing. And Kishore Kumar, is just beyond words. Well, it seems that you have happened to miss out some big names, havent you? And coincidently, all these are hindus and we both are muslims. So looking at the lack of knowledge you possess, i find it futile to waste another word on it. yodling or westernization of music cannot last for a long time. movies and except kk all singers’ songs became super hits. “man re tu ka” “man tad pat” etc.etc. aap ka chori pakhda gaya hai. ab aur koyee naya naaam dhundiye Paagal ahmed. you have been exposed worm by our great mohd rafi fan bhagchandani. aur agar soul hai to thoda “soul searching ” bhi kar lena. 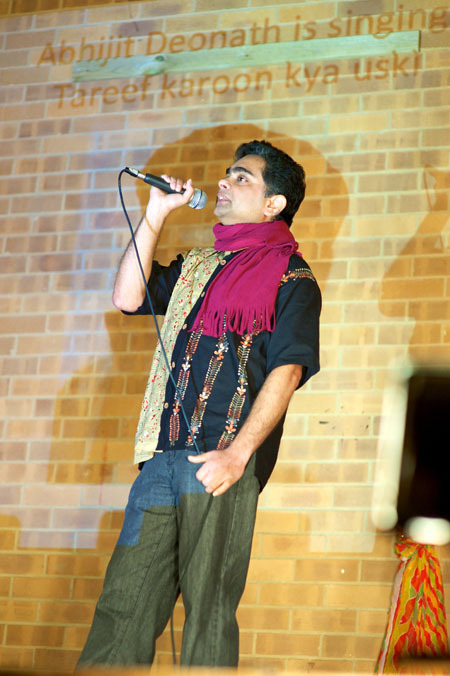 The songs that have been mentioned are great songs sung by Kishore and there is no dispute. But one thing that needs to be understood is that Kishore did not have an aptitude for classical songs and did not bother to learn it. If he wanted to, he could very easily have. So, if even he was forced to learn, the results would have been far from great simply because the interest wasn’t there. So all the humbug about what-if he had done this or done-that is nothing but sour grapes and immature or wishful thinking. His vocal range did not span the octaves need for this and that could be a possible reason for his disinterest. The bottom-line – he cannot be considered a complete singer without this in place. Over and out. Rafi had aptitude for this so he could perform well in this genre. He was a devotional man so he could sing bhajans better than any singer. He went to the border during the indo-china war to motivate the soldiers fighting for our country so the patriotic feelings helped him to sing those songs better than anyone else. He used to urge Khaiyyam to give him quality ghazals (non-filmi) so he had the interest to emote these types of songs extremely well. He took pains to modulate his voice based on the singer and situation and had reflected in his songs for various actors that he sang for. His vocal range was god-gifted and he used it in a big way for the songs he sang. Qawallis came naturtally to him. Even western music was not an issue as the interest to adapt was always inherent. Kishore had an aptitude for comedy so his comical songs are awesome. He was a person with a lot of depth and went through a lot of hardships, heartbreaks and failure in the 60s and that reflected in his sad songs. He enjoyed Western music so could incorporate the rythm needed in a lot of his fast songs. He was a romantic so his romantic songs had the required feel. He was a good mimic and that helped him modulate his voice to a reasonable extent. Kishore’s voice had a timbre that some will like and some will not. Rafi’s voice has always been considered more universal. His is the only voice that can suit a fakir as well as it suits a king. As far as throw is concerned, Rafi has been the undisputed king in this category. Kishore does it quite well too, just not comparable in my opinion. That song by Kishore in Anurodh was sincerely song but is no masterpiece by any yardstick. The laughter (or rather smirk) that you have burst into (post 18) is not funny. It is a serious matter that you have different names. Please make some honest investigations into your real name. Coming to your post 15, you have spoken a lot but said very little. There is hardly any thing in the post which is not repetition of your earlier post. Let me tell you that I have far decent collection of Kishore’s songs than the one you have listed in your post. And I listen to all of them fairly regularly. And here let me repeat what I have already said in earlier post ‘Rafi is the best with all things considered’. On the one hand you have written ”……… sonu nigam has sung all of rafi`s songs and amusingly, even the so-called hardest song “o duniya ke rakhwale”. , ‘……..the magnitude of his (meaning KK) talent that we see is without classical training and had he trained himself, rafi wouldnt have been a competition for him..’ and then you go on writing that you do not want to belittle Rafi saab. If above stanzas are not belittling Rafi saab then what are these? Are you not a huge bundle of contradiction, not sure about what you are talking about? I can demolish your point by point comments, but it will be wastage of precious time. Lastly let me remind you the title of this web site “Rafians Tribute to a True Mastreo”. That is main purpose of this web site. Please bear this in your mind. Moderator ji….re Post 15, 18 and 12.
will u allow anyone to come and throw dirt in to your house??? this is a serious issue . please do not make this sacred site a comical one. please throw out the fraudsters and their threads who masquerade as music lovers – now. from the rafi foundation , mumbai. Jo ek se jaada naam use karte hai oose “fraudster” kehte hai. 420 ka kalam bhi tere par lag sakth te hai. agar maloom nahi to ghar waalons se puchiye. Kishore kumar aaj hota to tumko bulakar “do laaafe” teekh jagah par lagate te yeh apraadh par. “Jhoote logon ke jaban se legends ke naaam shobhaa nahi dete – lafenge” ithna yaaad rakhna. You are truly fit for such strong language(s). Hahaha. Fine, I changed my name. And even this name that you see is not my name. So what? How does changing my name or keeping it the same matter by the way? Its not about my name, my friends. Its about the legends, that none of us is. Dont point out these small things as my name. Come to the point and talk about these two great legends. Read my reply above post no.15 and forget these trivial things as my name. Just know that I am a kishore fan and thats enough. Really good to uncover the mask behind the rubbish commenter called fasal ahmed. Fazal ahmed Post 8… apna naaam poocho apne mata aur pita se pehle…..aur phir yahan se dafaaa ho jaaao . your lie has beeen nailed by j k bhagchandani. see post 14. you shameless kishore lover and liar with many names…..kithne naaam hair tere?? I beg to pls pay attention to what I am saying now and not get unnecessarily offended, leave my post half-read and retort back. For Rafi`s sake, NO! I have gone through your post carefully and meticulously. But it seems that you havent given enough respect and heed to my post. Clearly the fact that you are always reiterating and repeating the same point about “yodelling” shows the lack of comprehensive research you have done on Kishoresaab`s work. I agree that yodelling was definitely a unique style of kishoreda and him alone. But what I have emphasized on in the post above is the “throw, punch and solidarity” in an untrained voice. Your lack of arguments is evident in your post when you keep lingering about just “yodelling” and talk of songs like “cheel cheel chilla ke”. Ofcourse, thats a fun song and well sung but the songs I mentioned are completely absent of ‘yodelling”. So, you need to go back and pls listen to those songs with unbiased perspective. Kishore Kumar`s throw and punch is clearly visible in all of his songs. Its very sad that you call yourself knowledgeble and call Kishore`s music ‘loud’. I understand that your ears are used to Rafi`s songs so much that you overlook and subsconcisouly ignore his true competitor-Kishore Kumar. Now, not all the great names Bhagchandaniji mentioned have admired Rafi publicly. Neither have they ever compared Rafi with Kishore. Rafi was a senior of Kishore Kumar. So, naturally, everyone had more respect for Rafi. Kishore was younger and a junior. But most importantly, Kishore was untrained, which already made a lower impression of him in the minds of composers. They knew that Kishore has sort of stumbled into singing world while Rafi was always and only a singer and that too, trained. And fortunetly enough, Kishore finally recognized the “khazana” hidden in his vocal chord that he hadnt had a chance to exploit just as yet. Those people who prefer Rafi over Kishore are just awed more because of the feel of classical music his voice carries. Its important to realize that Kishoreda was gifted by the almighty. The magnitude of his talent that we see is without classical training and had he trained himself, Rafi wouldnt have been a competition for him. Yes, I agree that there are some people in the industry who consider that Rafi is better but those people just dont seem to get past the belief that singing in a classically-influenced manner is more respectful. I can understand its not intentional. But, those who know what I am saying, are aware that the mere throw and beauty in Kishoresaab`s voice is beyond anyone`s capability. Singers who sing are well-aware of it, which is why you wont find anyone attempting his songs. At the moment, Im listening to “Phoolon ke rang se” and what a divine pleasure it is! Note that when I am talking about Kishoreda, I dont want to belittle Rafisaab. He remains a legend still. Kishoreda and Rafi, are afterall the two gems of our music industry. They both had the power to connect us to god. We are unlucky to have lost them early! But its sad that Rafians, unlike Kishorefans, never want to look beyond Rafi`s songs and rarely do they bother to research Kishore Kumar (like I just proved above). All that rafians know about are the fun songs that Kishoresaab has sung. Why? Because these songs got really famous and that’s because it was the first time ever that people had come across such a mad artist and his mad singing. Rafians really need to go through hundreds of Kishoreda`s gems they havent listened to and also the ones with Lata and Asha. Tum Bhi Chalo, Aane Wala Pal Jane, Aapki Aankhon mein kuch, Pal Pal Dil ke paas, Meri Bheegi Bheegi Si, Chingari Koi Badke, Chalte Chalte Mere Yeh Geet, Kuch Toh Log Kahenge, Zindagi Safar Mein etc. Please see the post no. 8 in this thread written by one Mr. Fazal Ahmad. And then please read post no. 2161 in ‘An endless feud between the fans of Mohammed Rafi and Kishore Kumar’ at Kishore Kumar web site. The same post has been submitted under another name Ranbir. In fact under the name Fazal Ahmad, the comment has been posted at many threads on this web site. It is there in ‘Contribution of Rafi in Biswajeet Films’ (which has been suitably replied by Mr. Souvik Chatterjee), also in ‘Mohd. Rafi: The voice of unsung heroes’ thread etc. Do we need more proof of some Kishore fans dubious intentions of mischief, creating chaos and instigating Rafi fans? Same bunch miscreants appear in different names to exhibit their mental imbalance. I have already replied to this guy’s post in this thread (post No. 12). Thank you very much for your comments. I will certainly look into trying to post a link to the video of the show if that is possible. Binu-ji, it is great to see that you and the Rafi foundation works so tirelessly, networking everywhere you can, etc. to keep alive the memory and appreciation of Rafi Sahab. I congratulate you for organsing the successful sham-e-rafi program on 25th Sept. and wish you the best for your future shows. Long live the memory of Rafi Sahab. When you say or rather advise us to listen to songs ‘hal kya hai dilon ka’, ‘phoolon ke rang se’, ‘aapke anurodh pe’ ‘kuch to log kaheinge’ etc. of Kishore Kumar, you are presuming that we have not heard them. There can not be a greater deviation from truth. We are Rafi fans even after listening (and listening carefully) to all above said songs. All singers have a good number of gems to their credit. So has Kishore. So has Mukesh, Hemanta Kumar, Talat Mehamood. All these great singers had certain uniqueness to their singing. But when we say Rafi is best it means that it is the conclusion drawn after ‘all things considered’. Mere yodeling does not make Kishore best. And please do not confuse between singing and other talents of Kishore. You are talking like most of the ignorant Kishore fans talk. Your sweeping statements like “kishore kumar was unique. no one ever had such a tremendous throw and solidarity. and now we can just imagine what kishoreda could have done if he was classically trained from his childhood. his voice would have broken the boundaries and conquered the world! !” and “…….are “almighty has not given even one-tenth of that charismatic resonance that kishoreda was rewarded with, to anyone else” are utterly laughable. Do you think that music mastroes like Naushad, Roshan, Madan Mohan, Laxmi Kant PyareLal, O.P. Nayyar, Shankar Jaikishan were musically novice not have discovered Kishore’s talent? And please do not use the words voice texture, timbre etc. Mere use of these words do not make you knowledgeable, the lack of which you have amply exhibited in your post. Only conclusion that can be drawn is that it is you who has not heard Rafi saab carefully. In the song Rafi saab yodels (and rocks). He had deliberately left yodeling and concentrated more on finer aspects of singing rather than such gimmicks. I am sure had he ventured into it, he could have yodeled as good as Kishore (or even better) even in his sleep. Understood? Thanks for u expert comments fazal ahmed.Great anaylsis , but u require dialisis.U have got no knowledge of singing.What do u call masculinity.I think according to you it is nothing but a hoarse and loud voice.My dear expert that is not masculinity.Just listen to Aye watan,Aye watan.The bass and the masuclinity it potrays.It is not just loud singing.And again u talk about versatlity.,YOu are right it is versatality to sing in same voice for different actors,and to potray masti do yodelling and make all kind of stupid noises like cheel cheel chilake ke song.Masti is subtle like tum se acha kaun hai, laal laal gaal, etc. So my dear expert keep urself out of this holy site.And stop giving teachings to us .There are many not so called experts like you like yesudasji, balasubramaniumji, udit narayan, sonu nigam, unni menon, mannadey who consider rafi saab as ultimate.So better keep ur mouth shut. Re: post 8… I live in mumbai and we had the shaam-e-rafi saaheb houseful musical at mumbais dinanath hall located at music lover’s hub at vileparle. the next will be a special tribute to Maestros laxmikant and pyarelal via mohd rafi saahib. dates and venue is being finalised having come back home after a small and swift work and holiday session in kerala and mangalore. looking forward to “numerous shows” all round 12 months of the year in memory of saint singer mohd rafi sahib. Thanks Nasreeen ji 4 taking the rafi saaheb works forward and forward. few days back on tour to kerala and mangalore met rafi friend ahmed bhai and a group of rafi saahib lovers. one person has agreed to donate ten cents of land in calicut for a rafi saaheb memorial. we at the rafi foundation will take this forward at calicut and at various places. while at kerala, last sunday say this memorable write-up but was unable to post due to power cuts. 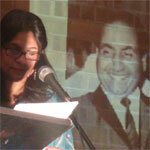 our compliments 2 you for taking the rafi saahib legacy – forward. we had a shaam-e-rafi sahib musical on sunday 25th sept. it was dedicated to yahoooo shammi kapoor and a portrait of his was painted “live” by our artist/painter c.s.pant . it was auctioned for a social cause the same day. it was a great show and 950 music lovers and fans – enjoyed the musical fare. in attendance were artist painter mr sharad vaikool and his wife – both closest friends of rafi saaheb. mr sharad vaikool has built a art centre and a mohd rafi museum at kolhapur – a wish of mohd rafi – fulflled. so, on we march to greater works to take the mohd rafi legacy – forward. Kishoreda was a maverick. His voice had a eternal resonance and “Khanak” that was unique! Voice was uniquely deep and the throw, punch and power in his voice make him the most difficult singer to sing. Rafi was undoubtedly a fabulous singer but Kishore Kumar was pure genius. Here is an anecdote (story) I would love to share with you all. I had always been a Mohd. Rafi fan, since I was a kid. Like my parents and friends, I, obediently followed the tradition to listen and admire Rafi and only Rafi. His “Makhmali awaaz” was always a treat to my ears. I would sing his songs at the school and with friends. People liked me because I was eventually, if not easily, able to sings those classical numbers. I was admired. But, then I had a chance to listen to Kishore da`s songs. I was moved! His voice was uniquely LARGE. The base in his voice was incredibly deep, unlike any other singer. His voice was inimitable. Such strong voice, reflected pronounced masculinity. His songs like ‘Hal Kya Hai Dilon Ka’, ‘Phoolon ke rang se’, ‘Aapke Anurodh Pe’ ‘Kuch to log kaheinge’ and many others, are great examples of his talent. Kishoreda`s ability to sing such diverse moods and styles can clearly be witnessed in above songs!! Interestingly, just notice the change in timber and texture he brings singing these diverse songs- something which Rafi never did; he just sang with the same timber/texture. Kishore could sing all the way from his upper part of the chest like in “Aapke Anurodh Pe” (where his voice comes out with so much depth and yet, he doesnt run out of air!! ), then his throat like in Hal Kya Hai Dilon (his vocal chord sounds like this huge rod with incredibly high radius!) and all the way up to his mouth in Pyaar Manga Hai Tumhi Se(where he just whispers and the romance spreads in the air!!). I challenge anyone to do justice to these songs! Kumar Sanu and Abhijeet just copy one little “pehlu” or “style” of Kishore`s versatilty (just make Kishoreda`s voice thinner by 50% and add some nasality in it and you get Kumar Sanu, Yodell-ish singing style that too with erratic consistency and you get Abhijeet). One little Rang of multi-coloured Kishoreda has made their lives!! Just think about it. You would see many singers singing Rafi`s songs, giving him a good enough tribute. There are Sonu Nigam, Shabbir, Mohammad Aziz and many others who are fairly good at it (who have even sung O duniya ke rakh wale, the hardest song Rafi ever recorded and infact, Sonu has done considerable justice) But Kishore Kumar was UNIQUE. No one ever had such a tremendous throw and solidarity. AND now we can just imagine what Kishoreda could have done if he was classically trained from his childhood. His voice would have broken the boundaries and CONQUERED the world!! The khanak in kishoreda`s voice was a god-gift and the almighty has not given even one-tenth of that charismatic resonance that kishoreda was rewarded with, to anyone else. Kishoreda, sadly, recoginzed his talent quite late, way after he was already dragged into acting by his elder brother, Ashok Kumar– and surprisingly enough, his acting skills are still admired. What a multi-talented individual he was indeed. But its sad that we lost him early. Conclusively, I hope and pray that the Rafi`s fans break their old bias for an hour and just listen to the songs I have recommended above! And as for Rafi, he has been my guru and idol and I always will be his fan. ‘Yaad na jaye..’, ‘Mohd Rafi tu bahut yaad aya…’, ‘Meri Awaz suno’, ‘Tum mujhe yoon bhula na paoge..’, ‘Mujko mere baad zamana dhoondhega…’, ‘Rafi ke khyal aaye to aate chale gay’.., are some of the appropriates titles of such Rafi dedicated nites. Thanks Narseen ji for providing first hand account of the great program. Is it possible to post the video of the program (at least some parts of that) on this site through a link? Thank you for your comments. All of us who were involved with this event (Yaad Na Jaaye) are very grateful to Pradeepji for putting this up on the website. This is just one example of the kind of events that lovers of Rafi Sahab organise all over the world. Our group is very lucky to have made it to Rafi Sahab’s website and we feel very honoured indeed. congrtas,and hats off to ur effort for the success.I am from Mauritius. Unfortunately i couldnt be there .Grateful if i cud get a recording of the event.please. Reading all the congrats, i guess this show was extra fabulous. i wish i was there. i never saw mohamed rafi in person but can remember when he went to south america – (british guiana in 1965.) i was 7 years og age. to our bollywood singing in those times known as Golden period of Bollywood music. Nasreen Namaste, Thanks for updating me regulary.I am retired bank manager,though i like all singers,rafisaheb is my weak point,i have good collection of gramophone LP records of rafisaheb,since last three years i am arranging a video show of rafisaheb’s very very rare songs on big screen on 31st july every year at my native place nagpur,also i have wrtten articles on rafisaheb in leading news papers.I will be expressing my views hereafter.